Jeff J Mitchell/Getty ImagesPresumptive Republican nominee for US president Donald Trump gives a press conference on the 9th tee at his Trump Turnberry Resort on June 24, 2016 in Ayr, Scotland. 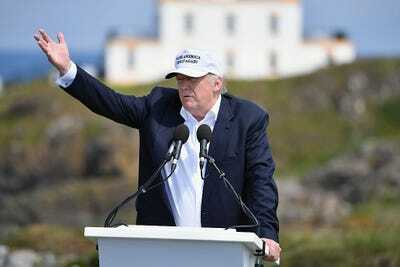 Donald Trump said Friday that the United Kingdom’s historic decision to bolt the European Union signalled that the entire EU was starting to crumble. “Well, it looks like it’s on its way, and we’ll see what happens,” Trump said, when asked at a press conference in Scotland if he would support a breakup of the political-economic body. The UK shocked the world on Thursday when it voted to abandon the EU. Markets plunged into chaos, and British Prime Minister David Cameron announced he would resign his post later this year. After the votes were tallied, parties from other EU countries were quick to announce plans about what to do next. While the unexpected results were cheered by Trump, President Barack Obama and presumptive Democratic presidential nominee Hillary Clinton took a more toned-down approach in a pair of separate statements.